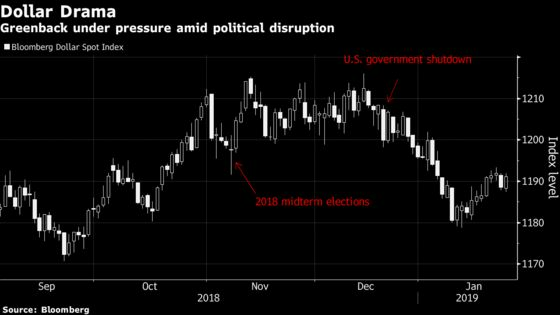 (Bloomberg) -- The U.S. government shutdown risks putting a dent in both the dollar and Treasuries if it drags on. A quick resolution could do the same. A drawn-out spending battle may collide with the looming debate over America’s borrowing limit, potentially raising the odds of a U.S. credit rating downgrade, as occurred in 2011. But some observers reckon the market reaction this time around would be different: Instead of driving a haven trade into Treasuries, concerns about the U.S.’s growing debt burden could reverse that flow, pushing sovereign yields higher and the dollar lower. The government has been partially closed for more than a month. Yet U.S. stocks are up around 9 percent over that period, while the greenback has softened only slightly. The 10-year Treasury yield reversed a dip from early in the new year and is around 2.72 percent. But as the political deadlock stretches into a record fifth week with no clear sign of resolution, growth concerns are mounting and investors are starting to draw lines in the sand. He’s describing a scenario in which the shutdown drags into March, inflaming the debate over the country’s debt ceiling. For some, that prospect is reminiscent of the market upheaval surrounding the debt-limit impasse under the administration of President Barack Obama, when S&P Global Ratings cut the U.S.’s AAA score. That action fueled a global sell-off in stocks, widened credit spreads and, ironically, spurred a flight-to-quality trade into U.S. debt. While S&P, Moody’s Investors Service and Fitch Ratings have each flagged risks of the current shutdown, none say that a downgrade is imminent. But the “brutal brinkmanship” of another debt-ceiling standoff could drive volatility in government bond markets similar to that of 2011, according to David Woo, head of global interest rates and economic research at Bank of America Corp. Except this time rates could rise, he said, given the “very large funding requirements of the U.S. government’’ and waning demand among foreign official buyers. The situation doesn’t have to get that bad to worry investors, who are already concerned about how the public sector’s pain may ripple across the economy. Senate leaders have agreed to votes Thursday on rival proposals for reopening the government for the first time since the shutdown began, though it’s not clear either measure can pass. White House Council of Economic Advisers Chairman Kevin Hassett said that if the partial government shutdown extends through March, the economy could flatline this quarter. “The longer it lasts the bigger the impact it has on growth for the U.S. overall, in an environment where you’re already seeing slower growth,’’ said Chuck Tomes, a portfolio strategist at Manulife Asset Management. If the shutdown were to start hitting consumer or business confidence, that would be a signal to cut back on credit exposure, he said. In this event, Tomes expects that Treasuries could still benefit from flight-to-quality trades. But Tomes says even if the shutdown is resolved this month, he doubts it would be “a significant positive that would unlock another leg higher in risk assets overall.” Moreover, in his view, a near-term solution may be detrimental for Treasuries and the dollar if it unleashes more government spending. “To get foreign investors to continue to purchase that issuance then you’d either need higher yields or lower valuations for the dollar,” he said. For his part, TD’s McCormick sees potential for a “knee-jerk dollar bounce” on a shutdown resolution, but he expects the U.S. currency to weaken in 2019 as the market focus shifts to other political challenges. The debt ceiling is only one concern in a list ranging from Special Counsel Robert Mueller’s investigation of President Donald Trump, to the U.S.-China trade war, the ratification of the new North American trade deal and a weaker growth environment. That said, the shutdown has allayed at least one problem for markets, according to Gautam Khanna, senior portfolio manager at Insight Investments in New York. Certain economic indicators are delayed, and a lack of new data may give the Federal Reserve cover to skip an interest-rate hike in March.